Passing earwax-tainted earbuds between friends is nobody’s favorite way to share iPod tunes. An integrated speaker in the smaller iPod nano and iPod shuffle models could end that practice for good, and provide opportunity for a host of new iPod possibilities. A newly published Apple patent describes how Apple could add a teeny speaker dome to the clip on the iPod shuffle or iPod nano. It’s a sneaky way to add some extra functionality to Apple’s smallest media players — all without adding any extra bulk. The addition of a speaker — along with Apple’s embrace of the iPod nano as a wrist-worn device and the integration of Nike+ exercise software — would also position Apple well for targeting the same fitness market that’s home to the Motorola Motoactv, NPD analyst Ross Rubin says. Over the past two years, several signs have pointed to one or more iPod lines being discontinued. Indicators include lackluster sales (last quarter, Apple sold 6.6 million iPods, a 27 percent decline from the same period in 2010), and a dearth of product refreshes for the shuffle and classic models. Nonetheless, Apple continues to support its beloved line of media players. And now it seems new energy may be breathed into the line. CEO Tim Cook said iPod is a “large and important product” for the company at Apple’s 2011 iPhone event. And Apple recently dropped the prices of its nano and touch iPod models, making them more competitive and more accessible to a wider market. Current iterations of the nano and shuffle have no external speaker, but the larger iPod touch does have one. 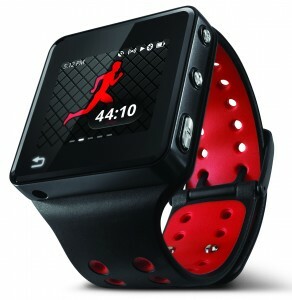 The iPod nano-like Motoactv, a wearable fitness-tracking music player. Rubin sees the addition of a speaker to, say, an iPod nano as a gateway to a slew of new use-case scenarios. “One thing it might point to is the nano being used to interface with an iOS device,” Rubin says, much the way the Motoactv can sync with an Android device, and be used to relay the arrival of calls or text messages on its small screen. Rubin says future nanos could be worn on your wrist, displaying social media updates relayed from an iPad stowed away in your backpack or messenger bag. A nano with a small speaker could also feature an audible alarm, making timed work-out tracking all the more convenient — useful when you want to use Nike+ without earbuds. Rubin also points out that you could activate Siri requests using the small screen on your wrist and have answers relayed to you through the speaker. If the speaker only ended up being used as a music playback mechanism, Rubin says, “It wouldn’t make a radical difference” in how we use or perceive iPods. True, but not needing to share earbuds anymore? Still a plus.